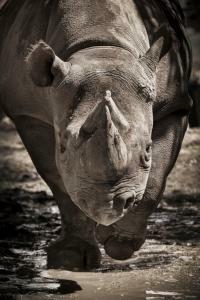 The Balule Nature Reserve in South Africa is the home of a number of critically endangered species--especially rhinos. It is also the home of a crack patrol called the Black Mamba Anti-Poaching Unit. The Black Mambas are local women who monitor the wildlife preserve to prevent poachers. They are unarmed and patrol in groups, looking for snares that trap rhinos and breaks in the fencing where poachers enter the preserve to hunt illegally. The good news is that since the inception of this crack anti-poaching unit in 2013, illegal bush-meat incidents have been reduced by 75%. Further, no rhino has been poached in 10 months in the reserve. It's about more than just police presence though. In addition to patrols and vehicle checks, the women in the unit have a key role in educating the local population about wilderness conservation and the economic benefits it can bring to the region. These are the sorts of activities that can bring long-lasting changes by modifying destructive behavior before it occurs. While probably not as cool as protecting endangered black rhinos, in the banking industry the FDIC is also trying to anticipate destructive behavior and to reward good actors. It is doing so by changing the way it will calculate FDIC insurance assessments in the future. For now, the assessment rules reflect a bank's CAMELS ratings and a set of simple financial ratios. Going forward, more consideration will be given to OREO and NPAs as indicators of increased risk and potential problems. Other indicators like core deposit ratios and a loan mix index are also incorporated in the new calculation. There is also an emphasis on year-over-year asset growth. These changes are coming because research by the FDIC finds that there is a direct correlation between rapid asset growth and bank failures, so it wants to identify these kinds of issues early in order to protect the fund. Interestingly, growth that comes as a result of merger activity is excluded in the new calculation as organic growth is of primary interest. The loan mix component has banks calculate the assets in each loan category as a percentage of total assets and then apply a historic charge-off rate. A 15Y charge-off rate is then weighted according to how many banks failed in each year. It's no surprise that construction and land development will see the highest multiplier (4.5%), C&I comes in next (1.6%) and then the lowest are found on farm and ag loans. This is interesting as history seems to be the guide, particularly when you consider all the discussion around bubble activity in certain ag loans and those backed by energy companies. It remains to be seen whether this effort to protect the fund using historical rates will be effective. Few of us doubt that construction and land development loans can be risky, but this calculation in combination with Basel III requirements for higher risk weightings seem to be doubling down when taken together. Therefore, look for this requirement for more capital to likely dampen construction lending efforts by community banks (perhaps this is what regulators want). All of these changes mean banks will have to consider loan mix in not only their business development efforts, but in their acquisition efforts as well. A bank with a lot of construction loans could improve its assessment and reduce its capital needs by simply combining with a bank that does a lot of ag lending--interesting for sure, but not exactly sure how risk changes. There is a lot more to a successful merger than calculating advantageous ratios for FDIC assessments or Basel III capital needs. Overall, the regulatory goal is to make banks with riskier business models pay more to insure their institutions or to hold more capital with Basel III. The United Nations recently awarded the Mambas the 2015 Champion of the Earth Award to recognize the importance and success of their work. While the UN probably won't give regulators or bankers any awards for their efforts to make the industry safer, the impact could be even larger in banking. We will have to wait and see if all of these changes make assessments more accurate, balance risk any better or eventually reward a lower risk profile as they are tested over time. Treasury yields dropped 1bp due to mild gains in the equity markets as investors continue to focus on corporate earnings. 1) JPMorgan reported Q3 net income of $6.8B (+22% YOY); ROA 1.1%, ROE 12; efficiency ratio 67%. On a YOY basis: loans +9% (consumer +15%); securities -16%; noninterest revenue -11% (mortgage fees -48%); provision expense -10%; compensation expense -7%; technology costs +6%; and marketing costs +15%. Active online customers 38.5mm (+7% YOY) and active mobile customers 22.2mm (+21% YOY). 2) Bank of America reported Q3 net income of $4.5B (vs. net loss of $232mm YOY); ROA 0.8%, ROE 7%; efficiency ratio 66%. On a YOY basis: loans +0%; securities +6%; noninterest income +2%; provision expense +27%; compensation expense -3%; FTEs -6%. Active online customers 31.7mm (+3% YOY) and active mobile customers 18.4mm (+14% YOY). 3) Wells Fargo reported Q3 net income of $5.8B (+1% YOY); ROA 1.3%, ROE 12.6%; efficiency ratio 57%. On a YOY basis: loans +8%; securities +19%; noninterest income +1% (mortgage banking -3%); provision expense +91%; compensation expense +3%. Active online customers 26.3mm (+8% YOY) and active mobile customers 16.0mm (+17% YOY). Small branches used to be about 3,000 square feet (4,000 for traditional branch), but now they are commonly 1,000 to 1,500sf in size. That's because fewer customers are coming into branches these days and because the cost of building a roughly 2,000sf branch is 67% less than the cost to build a 4,000sf branch and is 50% to 60% less to operate. By the way, the smallest branch we know of in the US is 350sf.